Welcome to our Puppy Page! Our mission is to breed the very best Small Munsterlanders possible. We do so by selecting Munsterlanders that meet or exceed the SMCNA breed standards, their hips are rated “good” or “excellent” according to the OFA, or receive a reading of distraction index of less than .50 in PennHIP. 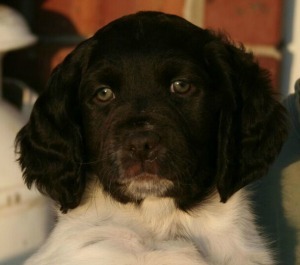 We also require that our dogs excel in the NAVHDA testing system and in all cases come from a long line of champions. If we use studs outside our kennel, we commit to using only studs who excel in favorable hunting traits and test scores. Most importantly, we only choose to breed dogs that have gentle, eager to please personalities as we want them to grow up to be outstanding home companion first and foremost! We promise to continue to support our buyers as the puppy grows and assist with training and preparing for the NAVHDA Natural Ability Test. We will only sell puppies to hunting homes to ensure that they grow up as active hunting dogs — which, after all, is what they love to do! 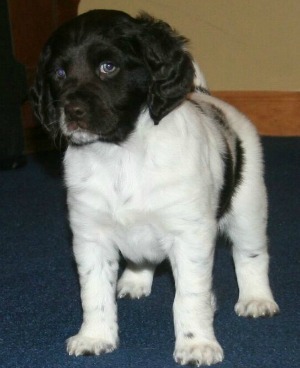 Like any commodity where there is more demand than there is product, there will be people selling Small Munsterlander puppies that are not SMCNA registered or have breeding dogs that are not approved by the SMCNA. 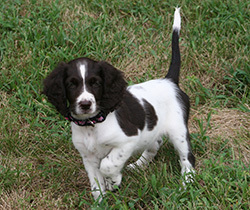 We feel that only by careful breeding and controlling litters will the Small Munsterlander breed continue to thrive as high-caliber versatile hunting dogs so we are strong supporters of the SMCNA and other SMCNA breeders. What is the Small Munsterlander Club of North America (SMCNA)? The SMCNA is the founding Club for Small Munsterlanders in North America whose purpose is to promote the responsible ownership of these dogs. From the beginning, its members chose to follow a path apart from that laid out by the AKC. Instead, the SMCNA adopted the philosophy of the German Club that only healthy dogs, that have a good temperament, that have demonstrated good fundamental hunting abilities and that within the FCI Standard for our dogs should be allowed to breed. The Breed Counsel examines each dog for conformity and proven excellent traits before allowing them to be certified to breed, in order to pass on the high quality traits that makes this breed healthy and outstanding hunting companions. Our kennel is listed as a Cooperating Breeder on the SMCNA website, which is also a good source of information when selecting a puppy from an approved SMCNA breeder. We are also members and our kennel is registered with the North American Versatile Hunting Dog Association (NAVHDA). 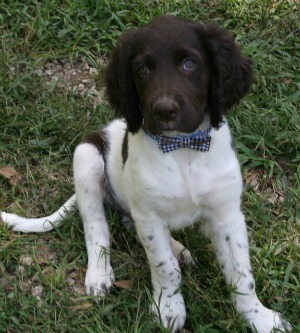 Small Munsterlander puppies look pretty much the same from all breeders – so what differentiates our puppies from the other choices in breeders you have? 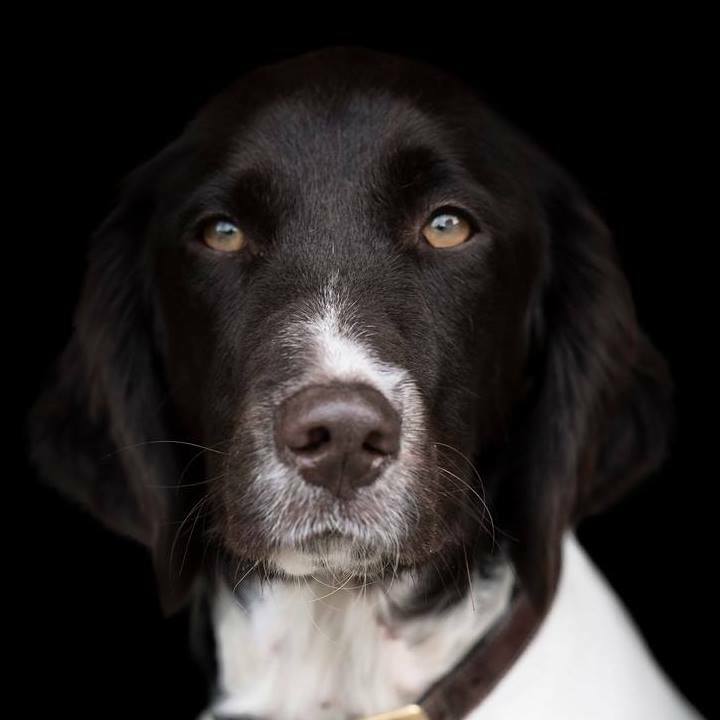 All Small Munsterlander breeders try to choose the very best dogs for breeding and are conscientious and committed to the breed and want to produce the very best puppies physically with above average hunting abilities. However, mentally, there is a small window of time in a puppy’s life to develop their brains and instill learning lessons that will create superior dogs, and that’s not evident on the outside - all puppies are cute and playful. It’s only over time that you will discover whether your puppy is calm, sweet natured and eager to learn, or hyper, fearful and/or aggressive in new or stressful situations or with other dogs. So what do you want to look for in a breeder’s breeding program that will ensure you purchase the very best puppy available? 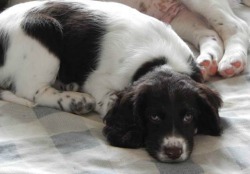 Even the very best Small Munsterlanders with impressive pedigrees will only produce average dogs if the environment the puppy is raised in is not optimum. Why? Because between 3-12 weeks a puppy’s brain and personality are developed, and if the breeder doesn’t work very hard during this time to provide the puppies with the environment and mental stimulation they need to develop optimally, the owners will have to work much harder as the learning curve gets continuously steeper after 12 weeks. Let us tell you about our passion for these highly intelligent, sweet natured dogs and how we have worked to ensure our breeding program is the very best available. Our interest in the Small Munsterlander’s intelligence and sweet personalities began shortly after we purchased our second Munster Ani. We wondered why there was such a difference in gun dog breeds - not only a Munsterlander’s natural hunting abilities but also their high intelligence – we’ve heard people liken their interactions with Munsters to not just dogs but human toddlers – what was it about this breed that makes them so very human-like – we thought it has to start with their brains and their mental acuity (such as memory, focus, concentration and understanding). So we began our research and there just wasn’t much out there, Munsterlanders were new to the US and basically there wasn’t even much general information about them. So we began our search with questions such as why is there such a difference in intelligence between dog breeds or even within the same breed? Is it all genetic or do environmental factors weigh in? Our interest was piqued when we began to read of new research that showed hip dysplasia in dogs was not genetic as was commonly thought, but rather due to the puppies environment the first few weeks of life. So we began to look for more information on the proper configurations of whelping boxes and how we can ensure our puppies did not develop hip dysplasia and found research that had been done by Dr. Carmen L. Battaglia on early neurological stimulation for puppies to maximize health and performance, also done in the first few weeks of a puppy’s life. One particular item of his research mentioned that the exercises were done during the 3rd-16th days of a puppy’s life due to that being a “rapid neurological growth and development period.” So that opened up more questions for us - what was this rapid development stage about and could it apply to other areas of the brain and specifically increasing intelligence? This led to other tremendous resources and information, particularly a book by Dr. Temple Grandin, Animals Make Us Human, which followed her research into brain development and emotional enrichment. Dr. Grandin discussed previous research done by Dr. Donald Hebb in the 1940s, a Canadian psychologist who had raised some rats in his home instead of a laboratory cage, and then later on when he tested them, his home-raised rats had higher intelligence and better problem-solving skills. Then in the 1960s another research phycologist Mark Rosenweig did further work with rats and enriched environments and found that adults as well as juvenile brains could expand and grow new cells, which was contrary at the time to what neuroscientists believed! Then in the late 1960s and early 1970s Dr. Bill Greenough, a professor at the University of Illinois, did work on how the brain changes in response to the environment, especially during learning. Dr. Greenough put a control group of rats in an enriched cage with toys and other stimulation and put the other group in the normal laboratory cages with no toys and just shavings on the floor. Dr. Greenough found that the rats in the enriched environment had more dendritic brain growth (dendrites are tiny little threads that branch out from brain cells and conduct electrical impulses into the cell body), and especially in the visual cortex of the brain. In Dr. Grandin’s own research, she studied pigs and put her control group in the normal farm baby pig pens with plastic floors and not much to do except play with each other. The other group was put in a “Disneyland for pigs” pen with lots of straw to root in and different types of toys to play with. Everyday Dr. Grandin would take out the old toys and put new ones in along with fresh, new straw. Dr. Grandin had hoped to find the same results of the researchers before her, but what she did find was surprising – at the conclusion of her testing she found that the enriched environment pigs did not have any greater dendrite growth than the pigs in the barren cage! Dr. Grandin had tested 2 parts of the pig’s brains, the visual cortex which was where Dr. Greenough had tested, and also the somatosensory cortex, which receives information from the pig’s snout. Dr. Grandin found that not only did the pigs from both environments have dendritic growth, but in some cases the pigs from the non-enriched environment had more growth. How could that be? Dr. Grandin repeated her testing with a new group of pigs and installed cameras so that she could watch the behavior in both environments when she wasn’t present. What she found was that the pigs in the non-enriched environment had more brain growth in their somatosensory cortex than in their visual cortex, so they were getting stimulation from their snouts instead of visual stimulation like the environment-enriched pigs. However, she discovered from watching the cameras of the pigs at night, that her enriched environment pigs slept soundly and were very calm with her during the day when she cleaned their pen. The pigs from the non-enriched environment were hyper and instead of sleeping during the night they would root around the pen, bumping into each other and their watering devices looking for stimulation. During the day, Dr. Grandin found that they were starved for attention and would surround her and bite at her hands when she was cleaning the cage. So although both sets of pigs were getting stimulation and developing brain growth during the critical periods of time, the type of stimulation created either pathological behavior (non-enriched environment) or desirable, calm behavior (enriched environment). We were intrigued and wanted to learn more and continued to search for more research that identified how to beneficially stimulate our puppies’ brains while teaching them to be calm, eager to learn adults. Without boring you with more research details, we continued to learn and to perfect our puppy training, and then in 2015 we read about a successful program called Puppy Culture, developed by breeder Jane Killion. We joined the Puppy Culture discussion group and were soon hooked with the success stories and with Jane herself. Jane was having a hard time training her Bull Terrier puppy and was looking for a better way to train and ran into the same problems we did – lack of information. She tried some of the current resources but they didn’t work with her dog, she tried taking him to various dog trainers and their methods had no positive effects on him, so she decided to train him on her own. She began learning theory and behavior modification through much of the same research we had found and as we read about her program we immediately felt that we had found a kindred soul, and she based much of her methods on information we had read about and so we felt we were on the same path! Our mutual goal was to develop calm, well-adjusted dogs who were above average in learning abilities, so we tried her program and have had amazing results! Communication – developing both dog and human communication skills to fit in comfortably with both societies. Emotional Stability – coping with frustration without anger and recovering from fear quickly. Habituation – giving the puppies enough exposure to the maximum amount of situations so that they develop a “so what” response and act calmly under stress. 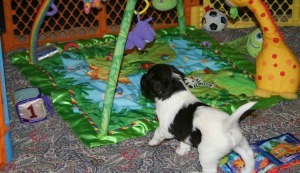 Enrichment – teach the pups that novelty and challenge are fun and not to be feared or avoided. Promote Health – various exercises when young such as Dr. Battaglia’s neurologic stimulation and later physical age-appropriate exercises to develop motor skills and improve overall health. Skills – learned behaviors that allow the pups to function optimally in human society. We continue to use other resources and early learning principles we have found are effective, and the combination of exercises, daily interactions and situational learning experiences – and lots of love and physically stimulating, age-appropriate exercise – has continued to improve our breeding program with the end result of raising well-adjusted, socialized puppies that have the skills for living with their new families, other dogs and society. 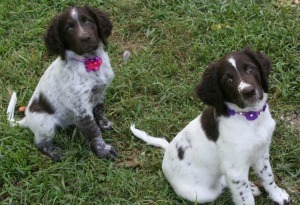 As breeders we are continually seeking out ways to enrich our puppies’ environment and give them the mental abilities to become easy to train, loving, emotionally stable dogs who grow up eager to learn, to think through situations instead of reacting with aggression and to become the best family/hunting companions for our buyers. This is evidenced by our puppies readiness for the world when they leave our kennel – potty trained, crate trained, wonderful recall (coming when called), no jumping and well socialized to other dogs. We will continue to research and improve our breeding program as new developments become available, as well as through our own experience. This is not the end of our Breeding Program story, but rather the beginning of continual improvement for the enrichment and enhancement of this phenomenal breed, our Small Munsterlanders! Please let us know if you’d like more information on our puppy training program and why we feel our Munsterlanders are extremely exceptional in an exceptional breed. (1) Carmen L Battaglia, PhD: Dr. Battaglia is an AKC judge, researcher and writer, and he has been a leader in promotion of breeding better dogs and has written many articles and several books. (2) Temple Grandin, PhD: Dr. Grandin is an author with degrees in psychology and animal science and has been a leader as an autism spokesperson and a proponent for the humane treatment of livestock. (3) Jane Killion: author, breeder, trainer and creator of Puppy Culture.